Systemates, Inc. today announced the celebration of the 11-year anniversary of Projectmates. Since 2000, Projectmates has served capital project owners and other construction professionals through cutting-edge technology that continues to innovate to meet today's industry challenges. Director of Construction John Moebes will speak at the Construction Owners Association of America Leadership Conference on November 10. Field work has never been more productive than with Projectmates construction management software and the iPad. Systemates, Inc. recently launched its latest version: Projectmates version 11.2. After more than a decade, Projectmates continues to be the trusted software for online collaboration and construction project management. In the latest version, Projectmates underwent a total application overhaul to upgrade the behind-the-scenes technology; business processes from change management to construction workflow have been upgraded to improve speed, workflow, usability, and increase the scope of what you can do. Systemates, Inc. announced today that Constructech Magazine awarded Projectmates and Office Depot the Gold Vision Award in the category of Corporate Owner Retail/Chain. Office Depot's Construction Department won the Gold Vision Award for its innovative use of Projectmates construction management software. Systemates Inc. announced today that The Trinity River Authority is continuing its 7-year partnership by renewing a long-term contract for Projectmates construction program management software. The Authority provides clean-water services to 17 Texas counties and more than 60 cities in the Trinity River basin. Since 2004, The Authority has relied on Projectmates to help manage and oversee construction and improvement of its capital assets worth $1.7 billion to date. Ventura County is leveraging Projectmates construction program management software to promote collaboration, increase accountability, and streamline complex business processes. Projectmates is at the forefront of Integrated Project Delivery technology by providing a centralized place for owners, architects, vendors, and contractors to communicate throughout the entire lifecycle of a project. Systemates announced today that Salem-Keizer Transit has implemented Projectmates 11.0, the industry's foremost online and collaborative construction management software. With its 100% web-based platform, Projectmates will improve project planning, execution, and close-out of the new transit center and park-and-ride. Industry's leading provider of enterprise construction project management software recognized for innovation and client satisfaction. Systemates, Inc. today announced that Constructech Magazine named Projectmates as a 2011 Commercial Top Products winner. Projectmates was named in the Trusted Products category; the construction program management software was first released in 2000 and has undergone two to three major version upgrades each year. Systemates today announced Milton Hershey School as the newest client of its online construction project management software, Projectmates. With a 2,640 acres campus to upkeep and numerous capital projects going on at any given time, the school's Planning and Design Department chose Projectmates for its cost effectiveness, functionality, and dedicated server hosting option. 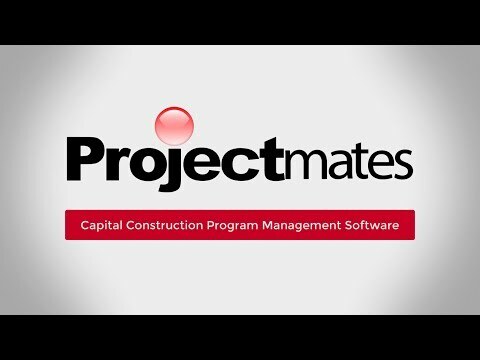 Systemates, Inc., the leader in web-based construction management software, recently launched its latest version: Projectmates V 11.0. The new version gives owners and construction professionals more browser and platform choice, global search ability, and increased performance. The Smarter, Easier Way to Manage Your Construction Projects. Schedule a free, personalized demo to get a first-hand look today. Our industry-leading Capital Construction Program and Project Management Software makes your job easy by improving communication, increasing accountability, and saving time & money. Join the Projectmates newsletter to get the latest news on industry trends and best practices.